Do you need basement repair? If you're experiencing dampness, wetness, leaking or pooling of water in your basement, then you almost certainly need some type of repair for your basement. Even though most homes are built to withstand moisture and dampness in the soil, millions of people still encounter problems with leaky basements or seeping, pooling water. If you're in need of basement repair, you're not alone. We repair basements all the time for all types of homes. It's not your fault if your basement is leaking. Often, after years of exposure to the elements the moisture barrier of your home simply begins to degrade. There are plenty of factors that could contribute to the acceleration of this process, but none of them are the fault of the home owner. Water seepage and leakage can cause extensive damage to your home and even threaten your health and the health of your loved ones. We are your basement repair specialists! If you're experiencing a leak in your basement, don't hesitate to get it fixed. The effects of water damage are cumulative, meaning that the longer you let the problem go untreated the more quickly damage to your home will occur. Luckily, basement repair is not a difficult feat for a trained professional. Our experienced crews can have your home warm, dry, clean and comfortable in no time. Give us a call today if you have any questions or would like to learn more about basement repair. Water damage is the term for all the various different types of damage caused by unwanted water in your home. Water may seem pretty harmless, but that couldn't be farther from the truth. It is almost always what creates the need for basement repair. The water that breaches the moisture barrier of your home evaporates and increases the humidity of the air in your house. When this happens, porous substances used in the construction of your home like drywall and wood absorb the excess moisture and begin to react. It's not uncommon to see buckling linoleum, drooping and browning ceiling tiles, crumbling and soggy drywall, swollen or warped wood and even rotting structural supports. The damage doesn't end there, either. Humidity encourages the formation and reproduction of mold, mildew and fungus spores which are all terrible for your air quality. Not only will the air feel clammy and smell musty, but it will also aggravate asthma and allergies and even cause upper respiratory infections. Water damage is expensive and time intensive to repair as well, often requiring that raw materials in your home be replaced. 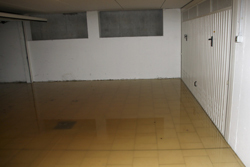 give us a call to learn how basement repair can prevent these damages today! 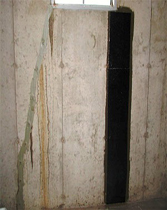 Water gets into your basement through cracks, seems and joints whose sealant is failing. When the soil outside of your home absorbs water, the pressure exerted on your basement increases. There are plenty of things that cause the soil to contain more water, the more obvious of which are precipitation, watering your lawn, and a reduced ability for water to evaporate from your soil. When your home was built, the foundation was constructed inside of a big hole dug in the ground. After the foundation was complete and your basement walls were built and waterproofed, the soil was filled back in around the walls. This "back filled" soil is much less dense than the soil around it, and absorbs and retains far more moisture. Whatever the factors are that contribute to the failure of your basement sealant, we're dedicated to locating the problem and performing a basement repair that lasts and lasts.